1. It's a sheep country. South Africa is a big producer of wool. The result: there is a lot of mutton meat. I found mutton on the buffet table every day of my trip there. Luckily, I like mutton. 2. Private wildlife reserves are great for time-constrained tourists. 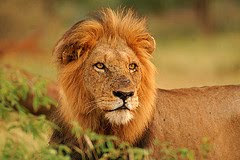 I wanted to be sure to see the big animals during my very short time available for a safari (24 hours). So I headed for a private wildlife reserve: Schotia Safaris, near Port Elizabeth in Eastern Cape Province. The gated area of a private reserve is smaller than that of the national parks so there is a higher chance of encountering the large animals I had come to see. In the end I was also rather lucky and saw warthogs, zebras, ostriches, several kinds of antelope, gnus, crocodiles, giraffes, lions, hippos, and white rhinos there. All these beasts are the property of the Schotia Safaris' owners. In comparison, on the next day the ranger and I spent 45 minutes roaming in Addo Elephant National Park (164 000 ha) before we managed to spot elephants hidden in the prickly bush. 3. Lions make a lot of noise at night. I was staying in the Warthog lodge in the middle of the Schotia Safaris reserve and the lions were probably close by outside the fence: I was woken up every hour of the night by their roaring. As I could have been potential food for the animal, I found the experience rather unsettling.